Pompey remain third in League One after Sunderland drew 1-1 with Blackpool at the Stadium of Light. 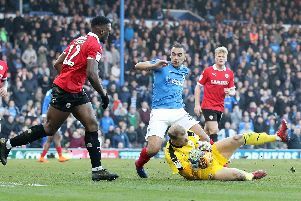 Jack Ross’ side, who had two games in hand over Kenny Jackett’s outfit prior to kick off, could have bypassed the Blues into third place with a home victory against the Tangerines. However, they could only manage a draw against Terry McPhillips’ in-form side, who stretched their unbeaten league run to six matches. Sunderland are now a point behind Pompey in fourth place but still have a game in hand. The Black Cats are also four points adrift of second-place Barnsley with one less game played. Armand Gnanduillet handed the visitors a 31st-minute lead. However, his effort was cancelled out by Jack Baldwin on 75 minutes to maintain Sunderland’s unbeaten home record in the league this season. While the Wearsiders failed to deliver on home soil, fellow promotion-chasers Doncaster Rovers cemented their place in the play-off places. They beat Southend, who play host to the Blues on Saturday morning, 3-0 at the Keepmoat Stadium. John Marquis, Mallik Wilks and Herbie Kane were all on the mark for Grant McCann’s side, who stay in sixth. In League One’s other game tonight, bottom-of-the-table AFC Wimbledon secured a 1-0 away win at Walsall. Steve Seddon scored the only goal of the game for the Dons.